Welcome to our family owned business. We are fellow horse lovers and have watched our daughter enjoy playing with model horses for years. We offer horse jumps that will make every child want to create there own courses. We are proud to say our jumps are handcrafted out of wood and Made in the U.S.A. using NON-TOXIC environmentally friendly paint. Shipping Information: Orders will be filled and shipped within 1 to 5 business days. Our Guarantee: The guarantee is simple: we will fix or replace damaged or broken jumps and accessories at any time. 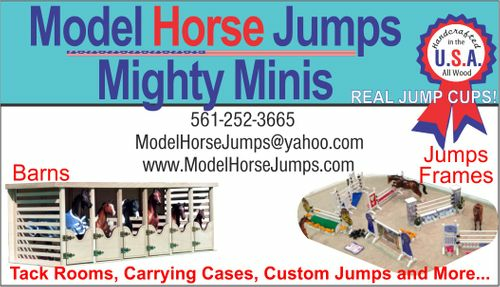 Model Horse Jumps offers realistic jumps to go with your favorite model and toy horses. Our jumps are all handcrafted out of wood and are MADE IN THE U.S.A..
home | about us | email: Modelhorsejumps@yahoo.com | CartCopyright © 2008 Model Horse Jumps All Rights Reserved.